FRIDOLIN cafés are owned by the Anglarill family. William Anglarill and his wife Mónika Jessen and her sister Traudi Jessen, (their family is originally from Austria) make and decorate the most beautiful cakes and pastries in the city using authentic European family recipes. They also offer traditional Bolivian tea fare and full lunch and dinner menus, and of course, ice cream! There are five locations in Santa Cruz and two in La Paz. They serve traditional European fare like Black Forest Cake as well as many Bolivian tea time favorites like empanadas and cuñapés. They also have some American favorites like cheesecake and lemon meringue pie. Locally Fridolin sells more cakes on Mother’s Day, for weddings and other special occasions and holidays than any other bakery and I think that has a lot to do with Traudi. She does the most amazing decorating. I’ve never seen such beautiful wedding cakes! She’s truly an artist! Fridolin is also a local favorite because the family is always looking for special ways to add details that will ensure the quality of their offering is higher than the competition. For example, with so many cafés in town they recently added a special coffee grinder to their fifth and newest location so your coffee is ground right before they serve it to you. Cruceños value special touches like that, especially since they spend so much time at cafés (cruceños always prefer the outdoor sidewalk cafés to other indoor restaurants). Over the past 20 or more years, the owners of Fridolín have continuously increased the quality of their fare and because they are one of the first true European style cafés and haven’t limited themselves to just being “another bakery” in Santa Cruz, they’ve pretty much set the standard against which other have to compete. It’s put them in a great position of authority, as cafés and bakeries go, and customers are very loyal to them for this reason. 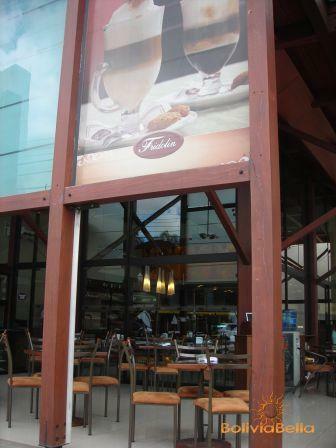 Fridolín cafés can be found at five locations in Santa Cruz and two in La Paz. Good luck getting through to them on the phone, though. They are so popular and take so many delivery orders, you’re better off just getting into a taxi and heading over there. No need for a reservation. Dress casually. They most recently opened a great big Fridolín on Avenida Monseñor Rivero, the current hottest hot spot in Santa Cruz. My favorite is the one on Avenida Cañoto, because it’s smaller and cozier and feels warm and homey. So why are they listed under "Ice Cream Parlors" you ask? Because traditionally they were an "heladería" (bakery/ice cream parlor/tea house) and over the years have become so famous for their cakes and pastries that, although they do still serve several kinds of ice cream, their baked goods really put ice cream on the back burner. But not for long: while you’re in Santa Cruz, you can visit Bits and Cream my favorite ice cream parlor, owned by their son Jan Paul and his wife Meily, who DO specialize in ice cream! See? Kept it in the family, so you won't miss out! If you visit Fridolín on Cañoto Avenue, you can have lunch or dinner there, then walk right next door for dessert at Bits and Cream.